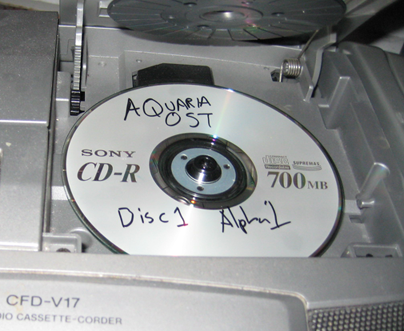 Derek and I have been working on a CD release of the Aquaria soundtrack. Its proven to be a painstaking endeavor - figuring out the best way to present the ~50 music tracks from the game, while designing some awesome packaging. Recently I burned a CD of what I call the “Alpha 1″ build of the OST, so I could try listening through the whole thing to see how well it flows. Now I’m working on “Alpha 2″; remastering tracks, rearranging others and extending some with newly written music. It seems likely that the whole OST is going to require two discs, and there’s a good chance that I’ll write some completely new bonus tracks for the second disc. The packaging will include liner notes with details on the creation of each track by yours truly and some great new art by Derek. We’ve been working on this one for a long time, but I think we’re finally getting there! Welcome to Day Two of the Seven Days of Aquaria! Anyways, in addition to the code and co-design I also did the music for Aquaria! Most of you have heard some of the music on the trailers and previews and what not. Since the game has 53 music tracks (!) we thought it’d be cool to put together a little music demo reel. 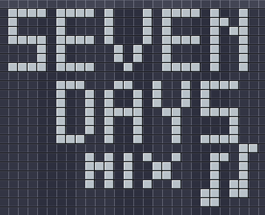 SevenDaysMix has bits from 10 tracks, including the full title music. Enjoy! Célu is Going to Gamma 256! Basically its a showcase for games made with 256×256 resolution or lower and use the XBOX360 controller. You can check out the full list of featured games on TIGSource. It also has music by yours truly! You can grab the music in MP3 format here.